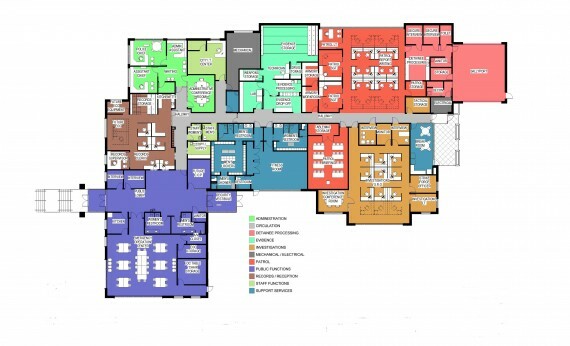 On the Kaysville November ballot is a Special Bond Election for authorization to issue $4.5 million in general obligation bonds. 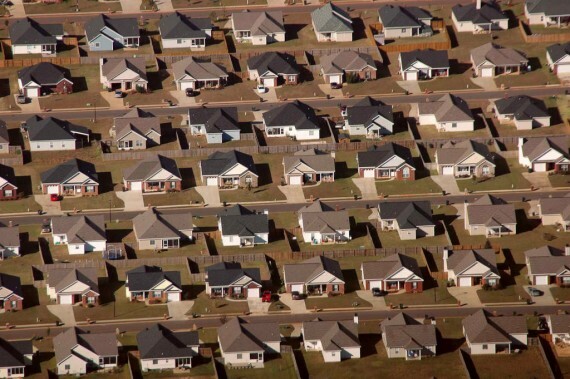 The cost is estimated to be a yearly $32.97, or $2.75 a month, on a $258,000 residence. 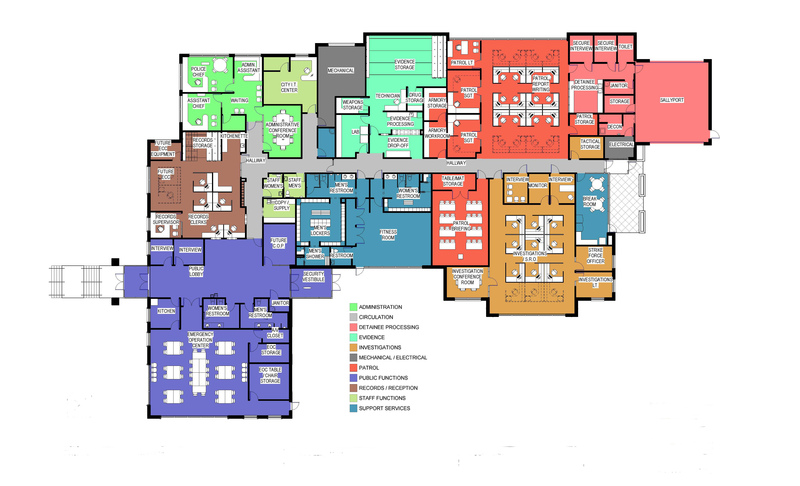 Currently Kaysville has no general obligation bond debt though there are long term liabilities. The police, as I understand it, are empowered to enforce the law, protect property and reduce civil disorder. Kaysville has 20 full-time police officers. However, the current police station does not meet acceptable seismic standards and has no emergency operations center or secure IT area for the city. At build-out the city will have grown from 26,000 residents to 42,000. There is no space at the police station to accommodate city and department growth. Problems also arise in evidence, records, and firearms storage; prisoner processing; secure parking; decontamination; training space; and other areas. 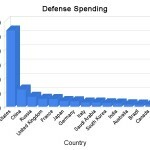 Although opposed to debt I also believe that the police and associated facilities are a most important part of any city. I therefore voted for the bond in early voting. Consider that for $32.97 I get a shiny new police station compared with curbside recycling that would have cost me $46.20. If I had opted in, I would have had the same amount of garbage collected, but for more money. When one also considers that your garbage is already recycled into steam for Hill Air Force Base, which do you suppose is the better deal? 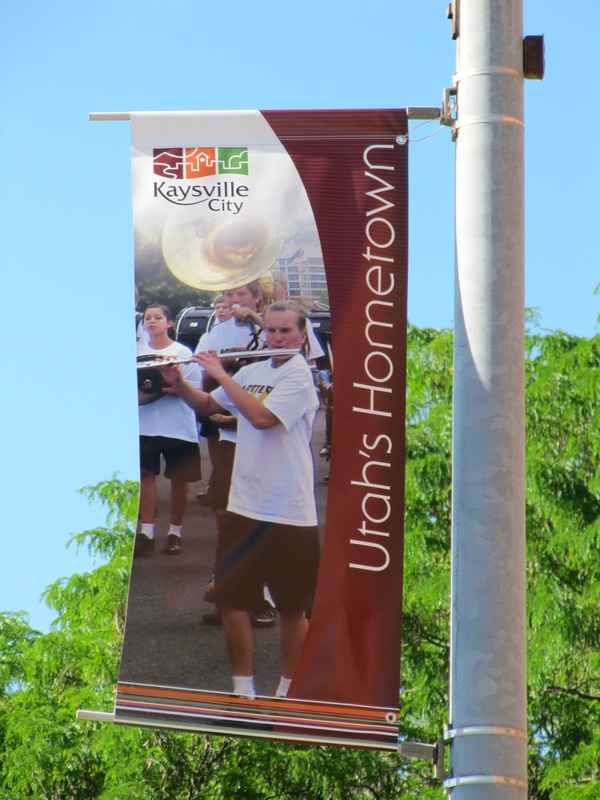 The next time you are in downtown Kaysville take a look at the street banners. They read “Kaysville City,” “Utah’s Hometown.” Sandwiched here between the two banner photographs are the two originals (click to enlarge). 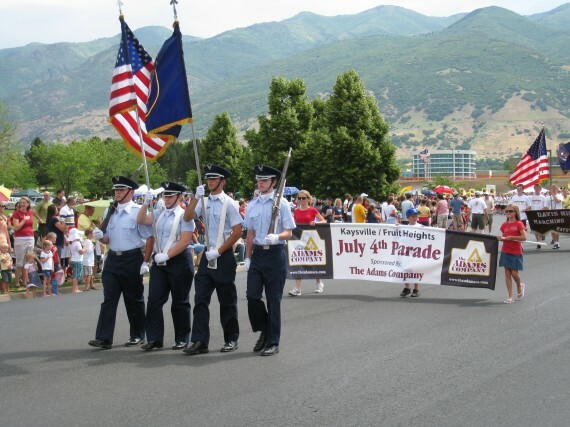 Mayor Steve Hiatt saw the photographs in my 2008 Kaysville 4th July Parade blog post and asked if he could use them. I was happy to oblige. So what are these banners for? I will explain in the following paragraphs spaced among the photographs. Brett Gee of Forthgear has been hired by Kaysville City to help the City develop a brand, particularly as it relates to marketing potential commercial enterprises. Gee explained that the City should set a strategy and marketing efforts to enhance the tax base. Forthgear looks at what makes each entity unique. 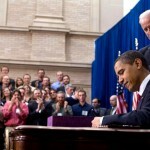 He stated that Kaysville needs to decide what they want to do to remain viable in the expansion of its commercial base. Gee says that if the City does not brand itself, it will happen on its own. He believes that affordable housing is critically important to the City which is predominantly white and LDS. The City has a higher household income than the rest of the state, the City is almost 50/50 male/female, and that the median age in the City is 24. The City needs to decide what story they want to tell. 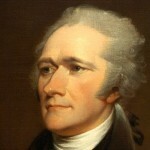 He stated that taxes will need to be increased to accomplish this goal. Forthgear has gathered and analyzed data for Kaysville City. A good brand understands the City’s strengths and weaknesses. 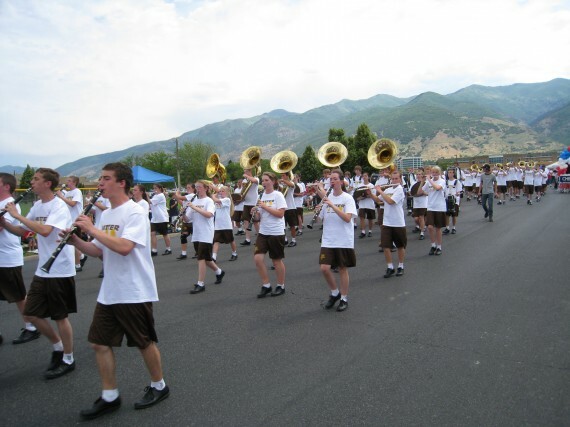 Gee believes that there are things that make Kaysville unique. Forthgear isolated some of those variables that make the City stand alone. 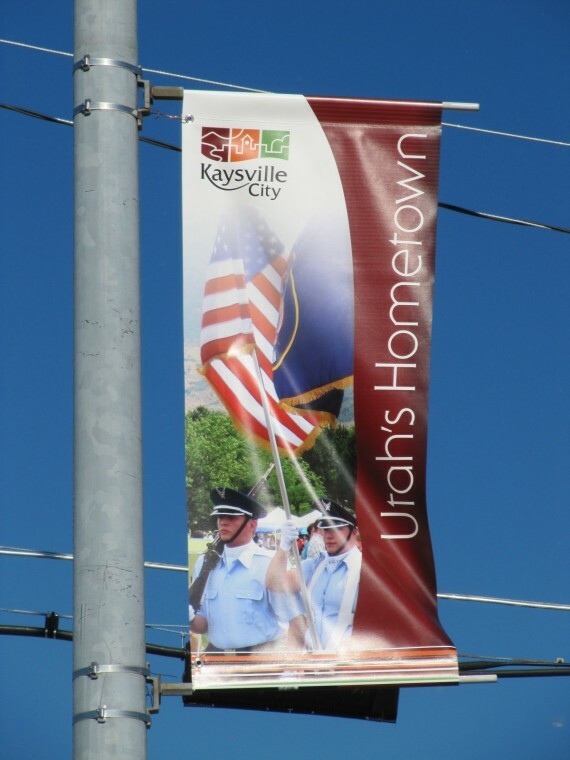 The brand positioning for Kaysville states that Kaysville City serves their citizens, both residents and businesses, and that Kaysville provides the opportunity for a lifestyle steeped in the traditional American spirit. He explained that Kaysville City is centralized in the county and northern Utah and is uniquely situated in the middle of everything. It is accessible to Ogden and Salt Lake City, is located between the Wasatch mountains and the Great Salt Lake, two important recreational areas in the state, and is bordered by two major traffic arteries, I-15 and Highway 89, both connected by one large, easily traveled east/west street, 200 North. Accessibility into the city is a significant benefit to Kaysville businesses and commercial enterprises. He believes that this is a marketable trait. The theme for Kaysville that is being recommended is “Utah’s Hometown.” Gee stated that a good brand creates emotion. At the June 1, 2010 Kaysville City Council Meeting he presented a copy of the new City logo, theme, letterhead, banners, website, business cards, etc. which showcased the new brand image. 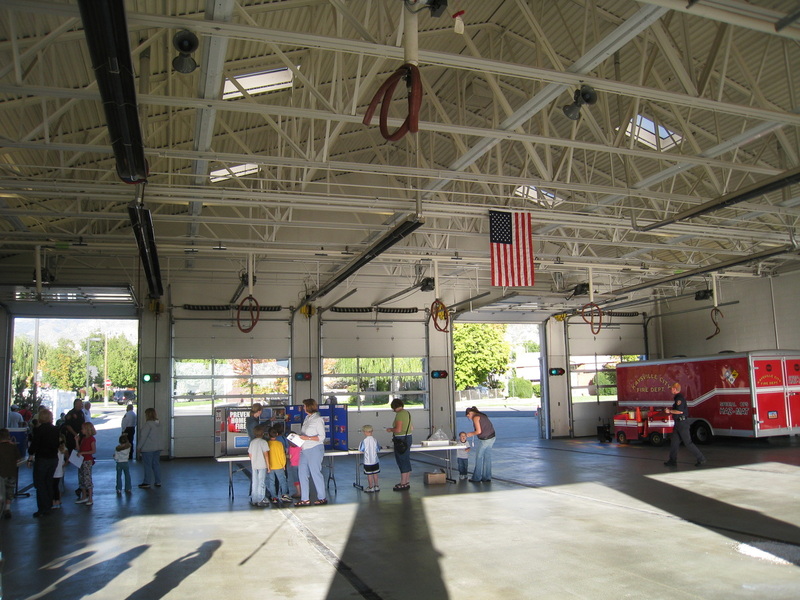 Today was the Kaysville City’s Fire Station Openhouse. Jill and I went along to tour the fire station. It is in no aspect a rickety structure as it is built to withstand earthquakes — a very handy quality in a building. Fire engines can’t put out many fires if they are buried under a mountain of rubble. We took a look at the fire engines and I climbed inside of one. I’ve never had any desire to be fireman but I am glad they are around. 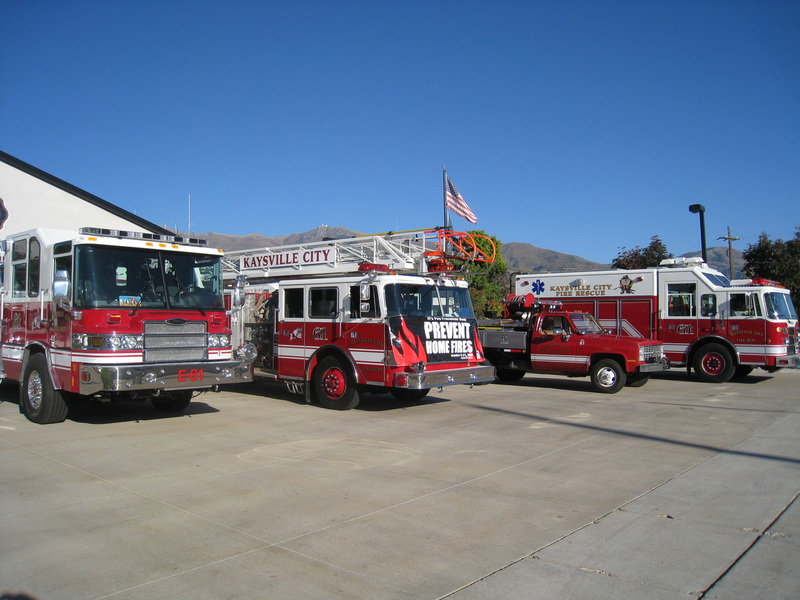 The fire department is responsible for fire emergencies and fire safety. The department has medical technicians and paramedics who have advanced first aid or crash injury management certifications. The fire department is convinced that a smoke detector on each level of the home cuts the chance of dying in half if there is a fire. The Kaysville Fire Department will test, change batteries, and install your smoke detectors free of charge. Remember also that a number on the front of the house, where it is easily seen, could provide a quicker emergency response time. The Utah Highway Patrol’s Seat Belt Convincer was in attendance though I didn’t stay to try it out. The Convincer features two separate single-occupancy carriages atop a 26-foot flatbed trailer. The steel frame carriages, which bear a resemblance to Jeeps, have drive trains that allow them to collide with each other at a speed of 5 mph. Typically, wrecks happen at 30-35 mph and if the seat belt is tugging at you this hard at 5 mph, you can then imagine how hard it would be in a crash. 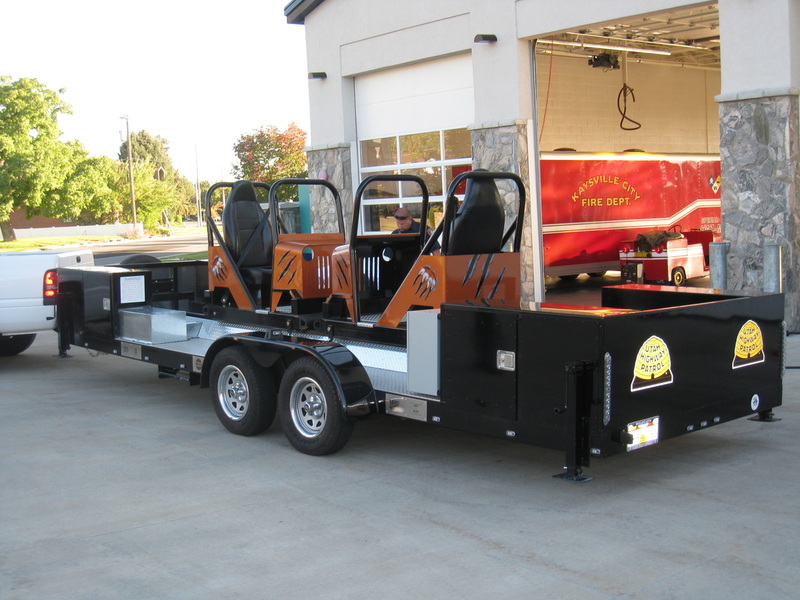 The new Convincer was a senior project designed and built by a group of Weber State University engineering students. An Intermountain Life Flight helicopter landed on the road to the rear of the station and some of the children got to climb inside. I was surprised how strong the wind was from the rotors as the helicopter landed. I wasn’t standing very far away and I had difficulty holding my camera. 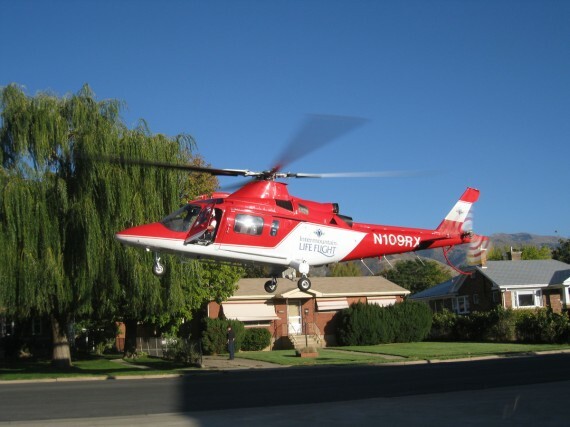 Intermountain Life Flight began service on July 6, 1978, the 7th air medical transport program in the U.S. and has transported 52,546 patients since it began.